The legend of John Dillinger still burns brightly throughout the Midwest. A stick-up man with a penchant for violence, Dillinger was shot to death outside the Biograph Movie Theater in Chicago by FBI agents hellbent on stopping an unparalleled crime wave. Johnny Depp plays Dillinger in the movie Public Enemies, based on the 2003 book by Bryan Burrough. For the better part of 10 months (between Sept 1933 and July 1934) Dillinger and his gang terrorized Midwest towns from Michigan to South Dakota — and all points in between. Dillinger escaped prison twice, was likely responsible for 10 murders, and pulled off numerous bank robberies. 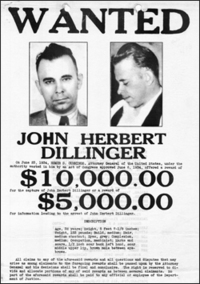 FBI agents in Chicago ultimately caught up with Dillinger by using a Romanian prostitute to feed them information on his whereabouts. On Sunday, July 22, Special Agent Samuel Cowley ordered all Agents of the Chicago office to stand by for urgent duty. Anna Sage called that evening to confirm the plans, but she still did not know which theater they would attend. Therefore, Agents and policemen were sent to both theaters. At 8:30 p.m., Anna Sage, John Dillinger, and Polly Hamilton strolled into the Biograph Theater to see Clark Gable in “Manhattan Melodrama.” Special Agent Melvin Purvis phoned Cowley, who shifted the other men from the Marbro to the Biograph. At 10:30 p.m., Dillinger, with his two female companions on either side, walked out of the theater and turned to his left. As they walked past the doorway in which Purvis was standing, Purvis lit a cigar as a signal for the other men to close in. Dillinger quickly realized what was happening and acted by instinct. He grabbed a pistol from his right trouser pocket as he ran toward the alley. Five shots were fired from the guns of three FBI Agents. Three of the shots hit Dillinger and he fell face down on the pavement. At 10:50 p.m. on July 22, 1934, John Dillinger was pronounced dead in a little room in the Alexian Brothers Hospital. This entry was posted in Public Enemy and tagged FBI, John Dillinger, public enemy by Frank Girardot. Bookmark the permalink. Great links, thanks Frank. Cant wait to see this dillinger movie. Is J.D,”Godfather” of take-over bank robberies, really dead or are these just copy-cats terrorists that hit 14 banks today, opening day of ‘Public Enemies’ across the country (total not complete yet). Hold-ups with AK-47s, shoot outs with police and several dead bad guys, life ain’t no movie. Pull up bank robbery website http://www.bank211s-mike.blogspot.com , http://www.scorpio-security.com or just hit Bank Terrorist Alerts on right sidebar for running up-dates.